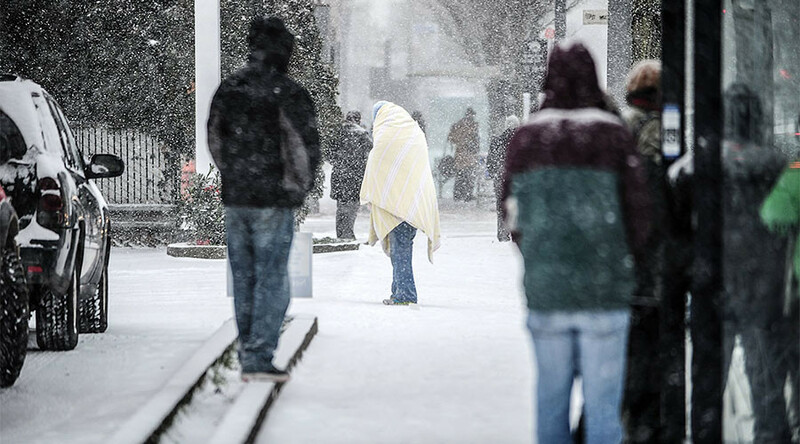 A one-day-old homeless baby froze to death in his mother’s arms on the streets of Portland, Oregon, bringing to five the number of people to succumb this year to the freezing conditions affecting the city. The baby was found on January 9 but details of the infant’s death emerged only on Monday, according to the Willamette Week, although the exact cause of death is disputed by authorites. It’s reported Portland Police responded to a 911 call shortly before 6am on January 9 after a passerby alerted them to a homeless woman pushing a shopping cart with a baby under her coat. According to the man, the woman was barefoot and only partially clothed. IN THE RICHEST COUNTRY ON EARTH.?? A number of text messages from first responders indicate the baby was still alive when they arrived on the scene. “Baby is conscious and breathing okay, but has been outside this entire time. Baby is ice cold,” read one text. It’s understood the woman had given birth to the child just hours before emergency services arrived, with the infant outside in temperatures barely above freezing since his birth. The mother claimed to have become pregnant “by the miracle of immaculate conception,” according a police report seen by Willamette Week. The woman could not answer a number of questions from police, including the child’s place of birth. "It was very clear to me she was very mentally ill,” Officer Justin Raphael wrote in his police report. The child was rushed to the Oregon Health & Science University hospital but was pronounced dead at 6:41am local time, after hospital personnel had performed CPR. Conflicting reports have emerged about the cause of death, with the pediatricians who attempted to revive him asserting that he was “viable,” while the state medical examiner disagreed, concluding in her report that the baby was stillborn, therefore no investigation will be carried out by police. Sufficeth to say, some communities are better than this. Wish I lived in one right now. That baby died bc Portland's horrid to homeless ppl. The freezing conditions are compounded by the fact that the city is in the middle of a housing crisis, characterized by a lack of affordable homes and increasing rent prices. The child’s death comes just days after that of 52-year-old Karen Batts, who died alone in a Portland parking garage a mere three months after being evicted from her home of 10 years for failing to pay the $338 rent.